Who ate all the green things yesterday? Me! I started the day with a particularly unattractive blend including frozen strawberries, hemp seeds, B-Strong brown rice protein powder, frozen spinach, a date, cacao powder, and almond milk. I’ve really been digging frozen organic spinach in my smoothies lately. It’s cheaper than fresh and it lasts forever! I’ve been blending the almond milk and spinach first and then adding everything else. You’ll probably have to use more liquid than usual. Works like a charm! 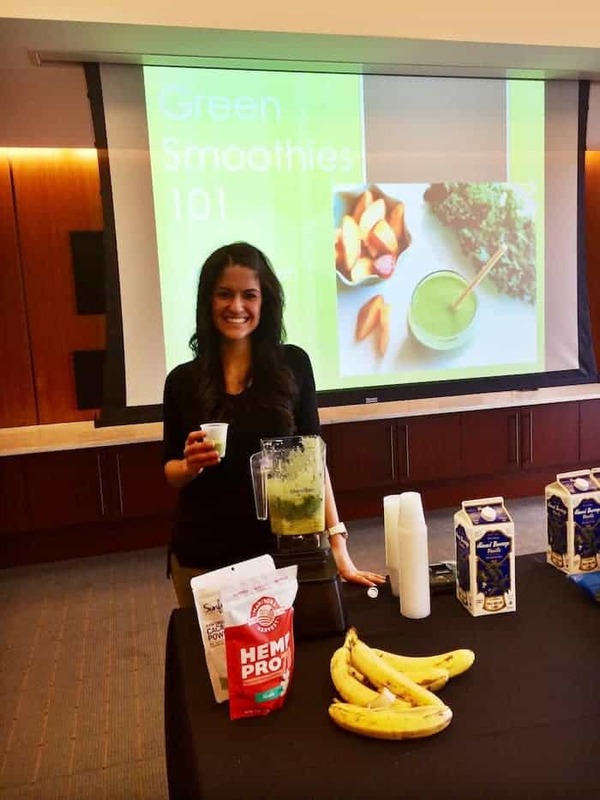 I taught a Green Smoothie 101 class around lunchtime at a law firm downtown and it was fabulous! I love that they wanted to showcase green smoothies for St. Patty’s rather than green cake. Hallelujah. I snacked on a couple of my favorite vegan chocolate banana muffins right after so I didn’t eat my arm off. I subbed in some protein powder for the oat flour, added a little extra banana, and ditched the oil. This recipe is so forgiving! Lunch was my farro, pomegranate, and arugula salad…so dreamy. I got a bag of baby kale at Trader Joe’s and dumped that whole thing in instead of using arugula. I also may have cheated and bought prepared pomegranate seeds because….#laziness. Obsessed! On the side I had an organic gala apple and some peanut butter. Dinner was a very sad-looking Amy’s burrito. I had to stay late at Alchemy so when I found this in the freezer I declared it dinner! I also had a cup of our lentil soup. When I got home, I ate some Wasa crackers with basil hummus, an unpictured hard-boiled egg, and a few handfuls of granola. Now for some excited news besides what I stuffed in my pie-hole! Have all you Columbus folks picked up the new Spring issue of Edible Columbus magazine? Flip to page 48! I’m featured as the Edible Entrepreneur and I couldn’t be more excited! For all you lovelies not in Columbus, simply click the link and you can read the magazine online! Congrats on the well deserved feature!!! PS. wasa + guac is almost impossible to put away! I have been using frozen spinach in my smoothies for the past year! Love it! I am the one person on earth who HATES bananas–I know, I know. For shame. So I also use frozen carrots and wait for it…frozen green peas to add sweetness to my smoothies. I am an odd one I know but give it a try…you may like it. Frozen carrots?! Now that I haven’t heard of! I’m so intrigued. Amazing! It’s getting greener here but there’s still some snow that needs to melt…ew. Thanks my love! Started my day with a green smoothie and had veggies and salad with dinner…but that was as green as I got yesterday :) AND Congrats on the article! So exciting! 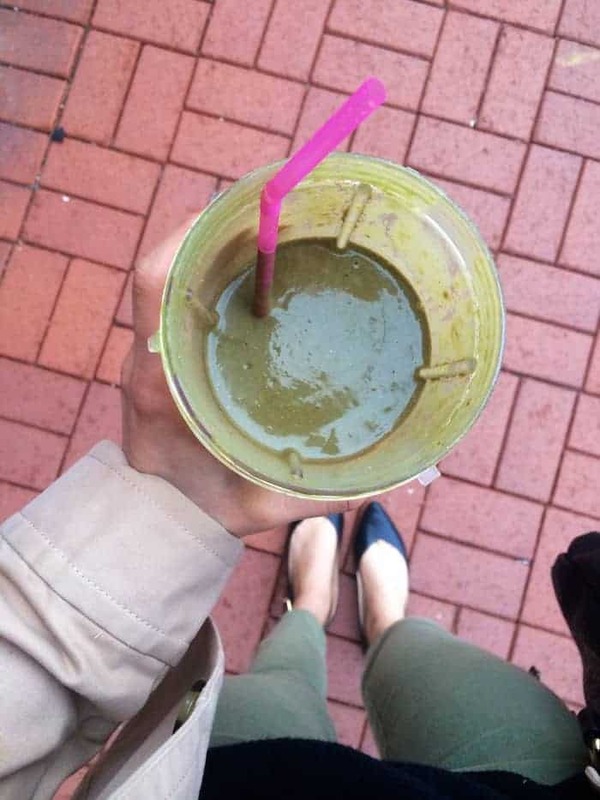 Hey…a green smoothie is all ya need, right?! what a wonderful write up :) you are my shining star! Such a problem! Whenever I do blueberries my mouth is blue for hours. Hooray for strawbs! LOVING the green pants!! I have also been crushing on frozen spinach in my green smoothies. It’s fantabulous! Thanks love! Frozen is best. I need to try peas soon! Congrats on the awesome feature! I’ve been loving my green smoothies everrryyy day :) I finally bought the frozen figs from TJ’s and I’ve ben LOVING them in my smoothies. Mmm frozen figs sound divine!!! Thanks so much, Dana! Bahah green smoothies totes win over green shirts. What a wonderful article; your business sounds incredible!! You should be so proud. That burrito actually looks really good. Good on Amy. she’s such a pimp daddy. Congrats again on the feature buddy! Amy is the love of my life. Second to you. Such a cool write up!! Reading that makes me want to eat there so bad! And awesome idea about the frozen spinach, need to try that! Found your blog over on bloggish – and thank goodness! I live in Italy which is the land of all that’s healthy, yet, I’ve never eaten worse (I use to live in CA where it was SO easy). Going to try some frozen spinach in a smoothie today! Thanks for stopping by, Madaline! Give frozen spinach a whirl–it’s the bomb.com! Hooray for you eating well! I´ like to know how to make the second salad you posted. It really looks so yummy.